On the number one place, with the title of “the world´s most expensive car” there can only be one. Today we´ll be writing about the car that has been sold for the most amount of money in the history of this world. The Maybach Exelero is a high-performance concept sports car built in 2004 by car factory Maybach. The Exelero has a twin turbo V12 engine that generates 700 hp. The car is designed to be a four-seated luxury limousine-like vehicle that combines luxury with performance. The Maybach is a one-off design built by Maybach-Motorenbau GmbH, on request for Fulda Tires, the German division of Goodyear tires. Fulda wanted to use the car as a reference vehicle to test a new generation of wider tires. For the testing of high-performance tires, the company needed a car that was capable of exceeding the 350 km/h (217 mph) mark. On May 1, 2005, the racing driver Klaus Ludwig drove the Maybach Exelero fitted with Fulda tires in Nardo, Italy and attained a speed of 351.45 km/h – setting a new world speed record for limousines on series-production tires! 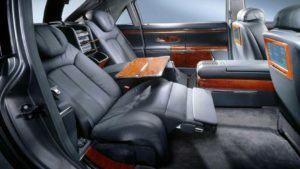 The idea behind the Maybach Exelero was to combine the elegance and first-class quality of a high-end limousine with the silky-smooth power of a sports coupé. At the same time that it offers pure luxury on the inside, the car attains a top speed of over 350 km/h – with an incredible weight of 2.66 tons. So how much was the Maybach Exelero purchased for? The Maybach Exelero 1/1 in the whole world was recently acquired by rapper Birdman for $8M! Although, seen as an investment-there are many people believing it will rise even further in price due to its quantity of only 1 car in the whole world. Congratulations Birdman!